The cleanest bathrooms of any campground we have ever stayed in, private,individual bathrooms with shower, large sink & counter space. They even have flowers inside each bathroom. The staff is friendly, helpful and outgoing. The office manager went out of her way to help us find a great restaurant for our anniversary dinner and helped me get flowers to surprise my wife. The creek is perfect for fishing and listening to at night while falling asleep. The grounds are manicured and flowers being planted while we were there. The park had a cinco de mayo party while we were there with plenty of fun, fellowship and food for everyone. Close to Interstate 40 with no curvy roads and only a mile off the exit. The sawmill next door is a little loud in the mornings but the camp staff has no control over that. I highly recommend this RV park and the area for touring attractions. Pretty location on a creek not far off the freeway. Close to fuel but a bit of a drive for groceries or restaurants. All roads are gravel but in good shape. We were given a site that was a bit small for our trailer (the trailer just fit but our truck didn't). We were in a back in although there appeared to be larger pull thru sites available. The park overall was quiet but our site was adjacent to the bridge/walk to the creek and was noisy with loud people back and forth, particularly early morning and evening. The bathrooms and laundry were very clean and neat. We would stay here again but would request a larger site away from the creek. Stayed for only one night as a stop over in a Class C Motorhome. Staff very helpful on the phone and when checking out. Park is very well kept. Neat and clean. Did not use the showers, bathrooms, or laundry but the facility looked nice. Very easy access to interstate. Would certainly stay there again. Really enjoyed our stay. Staff was super friendly and helpful. Sites were nice. They guide you to your site and help you park. Nice large stream ran behind our site. Bath, laundry, and social hall were very nice and clean and modern. Dog park was nice and large. Wifi and cable was very good. The creekside sites are GREAT here. Falling asleep to the sound of a river really did the trick! There is a wonderful flat riverbank which we lounged at for most of the day; very mossy, no weeds. Lots of trout fishing going on in the nearby Jonathan creek--bring a rod and reel and you may get lucky like we did! 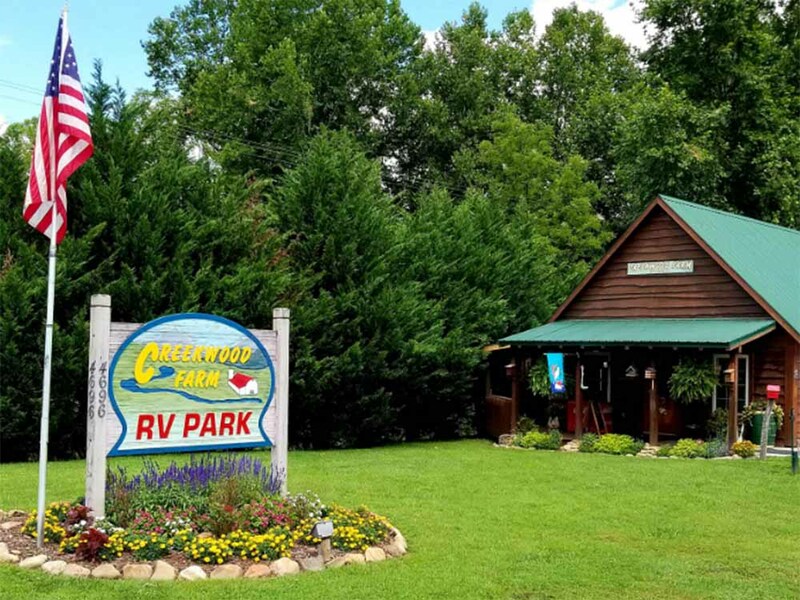 The park is tucked away off Jonathan Creek Road, a very straight, flat "valley" road, easy to drive and close to I-40. The facilities were immaculate, location beautiful, sites are well maintained;well-planned. Definitely staying here again, but for a longer stay. In the mountainous areas just west of Asheville,NC right off I-40. "LEVEL" campgrounds with all level well maintained campsites. Cabins also available. Campsites are grassy with gravel landing areas. Creek runs around perimeter of much of the park with back-n sites which most are shady..Great place to spend a quiet afternoon with the rippling creek in the background. A distance from Asheville but for the comforts might be well worth a look. Restrooms are individual and spacious. No shared facilities.. Two thumbs UP!. Hope I get the change to stay here again soon. We stayed one night each going to and coming back from Charleston, SC. The staff was very friendly and helpful. The sites are pretty level and in very good shape. The grounds and restrooms are immaculate. You're very close to the site beside you, so there is no privacy. They have a very strict pet policy, but this is probably why the grounds are so well kept. It was quiet and peaceful. There aren't any fire pits at the sites, but you can rent one. We always have our own just in case.The only reason I didn't give it a five on the Appeal Rating is because we like more privacy and we couldn't use our outside pet enclosure, so anytime we were outside with our dog, he was on a leash. Overall, it is a very nice campground, we just like more privacy. convenient to interstate! Convenient to Maggie Valley! The cleanest/nicest restrooms we have ever encountered. My wife uses them as the benchmark now. No matter where we stay, its "not as nice as Creekwood" or "almost as nice as Creekwood." 5 Star rating! Our kids (10 and 8) really enjoyed the park. lots of bike riding and playing in the river. We look forward to visiting again soon. 5 Stars across the board! Stopped for the night as we migrated south. The people are friendly and accommodating. The campground is nestled close to the I-40 on the banks of a fast flowing river (creek). Well kept and nicely landscaped. Rates are more than fair ($30) that include wi-fi, cable, power, water and sewer. Even though we were in an RV park it was as quiet as a state park. Bathrooms were spotless and private. The campground layout does not feel crowded. From Jct of I-40 & US-276 (exit 20), S 1 mi on US-276 (L); or From W Jct of US-19 & US-276, N 4.7 mi on US-276 (R) Note: Please follow these directions not GPS.